This recent series of meetings is incredibly important and focuses on the behavior of central banks and monetary policy in the wake of the tapering of the Quantitative Easing (QE) by the US Federal Reserve and subsequent emerging markets currency crisis. Talking about central banking and monetary policy is never easy. It is often framed in a boring and obtuse language, the reportage of the G20 and other international forums focuses more on reproducing images of the discussions than producing analysis of the nature of the discussions themselves and too often critiques of central banks is the province of a ‘reactionary form of anti-capitalism’(Postone, 2006, p. 99) built on anti-Semitic conspiracy theories, fears about the gnomes of Zurich and other phantasmagoria. Yet we must try to understand the operation of central banks. Since the final end of the gold standard with the collapse of the Bretton Woods System central banks are the key institutions in facilitating and securing the money supply. Central banks are currently that major apparatus of economic planning that states use. Thus a meeting of central banks and finance minister as part of the G20 represents an attempt to coordinate monetary and broader policy at a global level. Simply put central banks work as economic planners by contributing to setting interest rates and by intervening in global money markets to impact the exchange rates of different currencies. In the ‘neoliberal’ period (which I believe is either dead or dying) central banks were focused on price stability. Since, according to the dominant belief, prices signals work to communicate levels of supply and demand (rising prices reflecting either a decline in supply or a rise in demand and vice versa) price instability such as rapid inflation or deflation would distorts these signals and thus lead to bad investments (misallocation). Thus central banks work to raise or lower interest rates to keep inflation in an ‘acceptable’ range of between 2 and 3%. Lower interest rates make borrowing cheaper thus there would be more economic activity and more money in the economy thus heating it up whilst high interest rates would make borrowing more expensive and saving more profitable and thus cool it all down (Papadatos, 2012). However with the 2007 financial crisis (and this was foreshadowed in the 1997 Asian Economic Crisis) central banks roles rapidly changed. They stepped in to bail out financial institutions, buy their assets and lent to them to keep them afloat. The losses of these institutions were socialised(Papadatos, 2012). Both these approaches need to be understood in relation to the class antagonisms at the heart of capitalism. The fight against inflation is a masked form of the fight against the working classes’ attempts to increase wages, resist work and demand more from the state. Indeed the ‘stagflation’ (stagnation in growth, growing unemployment and rising inflation) of the 1970s was caused in many ways by the rebellions and demands of the working classes and peoples of the world (cf.Caffentzis, 2013). Inflation targeting is often aimed at keeping unemployment at a level that means that wage demands don’t lead to inflation and is part of a broader series of policies to break and dissipate the collective power of social struggles. By limiting the money supply states are capped from various forms of social expenditure traditionally used to placate militant populations – instead this militancy must be defeated. Disciplined monetary policy means disciplining society. (The other element to this is that increasingly the peoples of the world have taken on more and more private debt to make up the shortfall)(cf.Marazzi, 2011). Equally the shift to the current unorthodox monetary policy has worked to sure up the value of the assets of financial institutions as central banks stepped forward to bail out the banks and thus transfer their debts onto the books of the state – debts which have then compelled states to attempt to cut funding to various forms of social reproduction. The living standards of the working classes are sacrificed for finance capital – which is inseparable from capitalism on a whole. Central banks have also stepped in to stimulate demand. Most noticeably the Federal Reserve through Quantitative Easing, where until recently every month the Fed put the US state deeper in depth to the tune of US$80 billion dollars (the Fed invents this amount and then sells bonds to the same tune to back them –edit: this is incorrect see comment below) and then uses this money to buy financial assets. The financial institutions that received these funds then use them to invest and spend. This is the anti-gravitational machine that has kept the world economy from crash down. Much of these funds were spent buying and investing in assets and currencies from emerging markets (the new name for the large growing developing economies), then one assumes securitising, speculating and trading them. The constant flow of cash inflated the prices. On the other hand this meant that US debt – which has been growing since Reagan has reached astronomical levels and the possibility of a US default has increased the level of risk. The US has started to taper QE – that is cut back to US$70 billion a month which has sent financial traders fleeing from the emerging currencies as the prices will no longer increase(or at least because there is a perception they won’t increase which then becomes a self-fulfilling prophecy) and buying US dollars and Treasury bonds which are now worth more. As a parting shot these self-same speculators and their ideologues have been taking this moment to lecture emerging markets on the need to be more business friendly. This then compels these countries to enforce such policies on their populations in an attempt to attract back investment – populations that are often defiant and rebellious. The emerging markets have responded by trying to ensure the value of their currencies by increasing interest rates – but this might have the effect of slowing down growth. The contradictions in money between it being something to facilitate circulation and something stable as a form of measure are threatening to pull apart from each other driven by the centrifugal forces at its core. So this sets the scene for the meeting. The global capitalist economy has limped along since the start of the crisis. QE has kept the world capitalist economy growing but has produced astronomical debt and attempts to reduce the debt threaten to send much of the world economy into a tailspin. In the lead up to the meetings there seemed to be, and one must read between the lines and make assumptions here, at least two ideological camps: an orthodox neoliberal camp and a post-neoliberal one. These two positions share much but there are important differences particularly on the questions of monetary policy and debt/austerity that divide them. Joe Hockey and the OECD appear to be taking point for the former. The neoliberal camp is committed to ending unorthodox monetary policy (in due course) and hopes to encourage capital accumulation through comprehensive structural reforms. But more than this they seek intensified ‘macroeconomic coordination’: that the various G20 members make firm commitments around policy and clear targets and to be held to account to these at future meetings. National politicians are then meant to take up the job of selling populations these changes. Thus hard-edged transformations go hand in hand with the increased concentration of decision making power in the G20 (cf. Hockey, 2014). On the other hand there are the post-neoliberals lead by the IMF. They are also calling for similar structural reforms but are softer on notions of austerity and returning to orthodox monetary policy. Rather they argue for continuing unorthodox monetary measures to stimulate demand and lower market volatility and see debt as a longer term (I think they often see it as being ‘midrange’) issue to be slowly paid down. They make a sharp distinction between advanced and emerging economies and seek to allow the former more latitude in the hope to maintain demand. Equally the IMF is increasingly critical of the idea of austerity and no longer seeing debt reduction as central to growth. They are also increasingly worried about how cuts to wages and government spending in the North may work to further lower growth. Their concern seems to be about preventing any drop in growth levels and they want to try to maintain stability in Europe and the emerging world. The imposition of austerity and the general impact of the crisis have provoked large-scale social opposition in many countries and the IMF wants to avoid this. We can call this approach ‘Lagardeism’ (cf.International Monetary Fund, 2014a, 2014b). The common ground of both these positions is a commitment to labour market reforms (that is the undermining of workplace conditions, attempts to increase the labour-supply and thus competition for work, and the reorganisation of welfare provision) increase global competition and the removal of barriers to trade, and this is increasingly important, a focus on infrastructure construction as the next area of capital accumulation and demand stimulation. As well as these ideological differences this meeting happened in a time of increasing fracturing of relations between nations and national blocks at the G20. The media focused particularly on the geo-political manoeuvrings of Russia, China and US (seen through the lens of the street battles in the Ukraine). But more broadly we can say despite the linked interests of global capital different fractions of capital divided by industry and geography may have specific and conflicting interests. Equally different states may try not only to increase their own influence but also to pass on to other the hard work of imposing structural reforms on possibly militant and defiant populations. As witnessed by the continual failure of the WTO multilateralism is a bit of a lame duck. ‘There is no room for complacency. Addressing these challenges requires ambition’(G20, 2014, p. 1). They remain committed to unorthodox monetary policy and see its eventual reduction to be dependent on levels of growth. They are committed to increased communication and coordination of central bank actions and decisions to prevent financial instability if and when unorthodox monetary policy is further reduced. Whilst they committed to ‘putting debt as a share of GDP on a sustainable path’ they have stepped away from blanket and harsh austerity rather recognizing the need for ‘flexibility’(pp. 1-2). They have committed to a series of unspecified structural reforms aimed at encouraging business and providing policy stability particularly focusing on infrastructure development. They have committed to tax reforms that seek to tax business where profits are created and end tax avoidance. This will also involve increased communication and coordination. All this is of course frustratingly vague. The local media have been championing this as a triumph for Hockey as the G20 has made a commitment to a target for growth, but these commitments seem closer to the post-neoliberals in the IMF. If anything it expresses the deep level of malaise in global capitalism. Like the World Economic Forum in Davos the G20 has committed to try to keep stimulating the economy and reducing debt at the same time: thus to go both North and South. Drilling down into this what do these commitments mean? They mean that there seems to be an increased level of commitment and coordination amongst the G20 to keep the faucet of easy money to capital open thus increasing the debt burdens on states. Undoubtedly whilst they have stepped back from blanket austerity these debt pressures will be felt on social expenditure. They have committed to trying to coordinate central bank decision making – moving these institutions event further away from the highly limited popular input of the various forms of shallow democracy that exits in G20 states. They have committed to making a policy framework predictable and capital friendly – this it seems is a direct rejection of populist or Left alternatives that many Southern members of the G20 may be experimenting with. Thus again this is a step allow from the shallow democracy we have (the limited forms of representation and policy inputs in capitalo-parliamentarianism) and the reaffirmation of the authoritarian technocratic power of these institutions. We don’t know really what these policies will look like on the ground. What is clear from the IMF recommendations is that states will focus more and more on providing the funds and facilitating profitable investment in infrastructure, reducing labour protections increasing the integration of global trade and increasing competition (2014b, pp. 10-12). ‘We will contrast the wicked spectacle of capitalism with the real of peoples, with the lives of people and the movement of ideas’(Badiou, 2008, p. 100). Badiou, Alain. (2008). Communist Hypothesis. New Left Review(49), 29-42. Caffentzis, George. (2013). In Letters of Blood and Fire: Work, Machines and the Crisis of Capitalism. Oakland, CA: PM Press. Marazzi, Christian. (2011). The Violence of Financial Capitalism (New ed.). Los Angeles: Semiotext(e). Negri, Antonio. (1991). Marx Beyond Marx: Lessons on The Grundrisse (H. Cleaver, M. Ryan & M. Viano, Trans.). Brooklyn, New York & London: Autonomedia/ Pluto. Papadatos, Demophanes. (2012). Central Banking in Contemporary Capitalism: Inflation Targeting and Financial Crises. In C. Lapavitsas (Ed. ), Financialization in Crisis (pp. 119-141). Chicago, IL: Haymarket Books. Postone, Moishe. (2006). History and Helplessness: Mass Mobilization and Contemporary Forms of Anticapitalism. Public Culture, 18(1). Reblogged this on With Sober Senses. I encourage people to read and consider the arguments made here by Dave Eden. 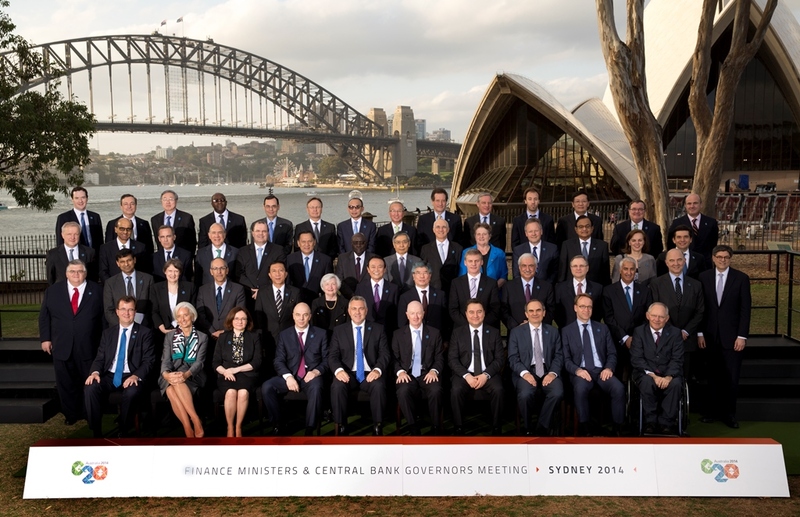 And to challenge all assumptions made by the G20 finance leaders summit held in Sydney Last Weekend — especially the assumption that says the world is divided into a few rich countries and many poor ones. 1. The explanation of Quantitative Easing is incorrect. The US Federal Reserve doesn’t issue bonds to back the money it conjures up from electrons. Instead, it buys bonds with that money. The fact that it has started to “taper” its bond buying is leading to a drop in bond prices and thus a rise in the effective interest rate on US government debt. 2. The country which has raised interest rates most dramatically (at least to my knowledge) in order to shore up the exchange rate of the currency is Turkey. In a world where many governments are engaged in competitive devaluation in order to secure trade advantages, this might seem counter-intuitive. The explanation for this is that Turkey’s banks are dependent on short term debt borrowed from abroad. Devaluation to the extent indicated by Turkey’s current exchange deficit (i.e. drastically) would massively increase the liabilities of the Turkish banks when measured in Turkish lira. As a result, the entire Turkish banking system would be bankrupted. Needless to say, the Turkish Government is determined to do everything in its power to prevent this coming to pass. And also needless to say, if it does come to pass regardless, the working class will be expected to pay. 3. Peaceful trade is a myth of the self-deluding capitalist class. In reality, every economic transaction under capitalism is a contest of power and the balance of that power is expressed primarily in the price at which the transaction takes place. Nation States organise the antagonisms involved in international transactions along national lines, therefore producing national political antagonisms from the various individual economic ones. Accordingly, these national antagonisms inevitably surface in fora such as the G20. Therefore, the “increased level of co-ordination” of which the Communiqué speaks is not an assured outcome, but merely an ambition. The economic forces of capitalism have long outgrown their national origins and the nation State system is a fetter on production. Capitalism cannot, however, construct a viable world State. Instead, the competing interests of national capitalist classes are driving nation States into conflict over what solution will be adopted to the pressing problems of the day. We are on the road to war. Because of the appalling consequences of such a war, the capitalists will try a lot of other things first, but eventually they won’t be able to help themselves. Only the working class can prevent that war. And while struggle within capitalism can forestall it, only a workers’ revolution that abolishes capitalism can prevent it permanently. Thanks for the feedback and corrections. I was under the impression that when the Fed created money it needed to issues T-bonds to back this, even though this money was then used to purchase bonds from private banks. Is this incorrect? Yes, this is incorrect. The colloquial term for Quantitative Easing is “printing money”. The effect of it is as if they had done just that – printed money, then used it to buy stuff, or pay off debts (which buying Treasury Bonds amounts to). Inflation hawks get the screaming heeby-jeebies at this, because they think it will lead to hyper-inflation (as in Weimar Germany or Mugabe’s Zimbabwe). Neo-Keynesians point out that the problem is not inflation, but deflation. Money is being hoarded instead of being circulated, thus creating a shortage of money for people who want to buy stuff. Printing money is a means of alleviating that shortage. Of course, the Neo-Keynesians are attacking symptoms rather than the cause, and the mechanism chosen has appalling distributional effects, but their position is at least superior to the inflation hawks, whose “sound money” policies made the Depression very much worse than it had to be. First, the bond buying program known as QE (buying both securities and bad debt off banks) does not require any government funds to operate–as the previous commenter pointed out, the accounts of the banks held at the FED are simply credited using a keyboard and the asset is transferred to the FED’s book (note: the government’s account is held at the FED but is a separate account). So rather than an increase in government indebtedness the opposite occurs as the FED transfers its profits (the interest payments largely come from the treasury itself!) to the treasury account. There is no technical limit to the amount of assets the FED can buy using this process, however if the FED later tries to sell back the asset to the private sector for less than the amount the FED paid for it, then the FED books a loss. The unlikely event of massive losses will render the bank insolvent, though in the current case the FED has opted to hold into their assets until they expire and, more importantly, central bank insolvency is meaningless: the bank simply performs all its functions on negative capital. This brings me to the last point: the only non-cosmetic effect of a central bank with negative capital is that it cannot transfer its profits it makes on held assets into the government account (which it is required by law to do so if such profits are made).